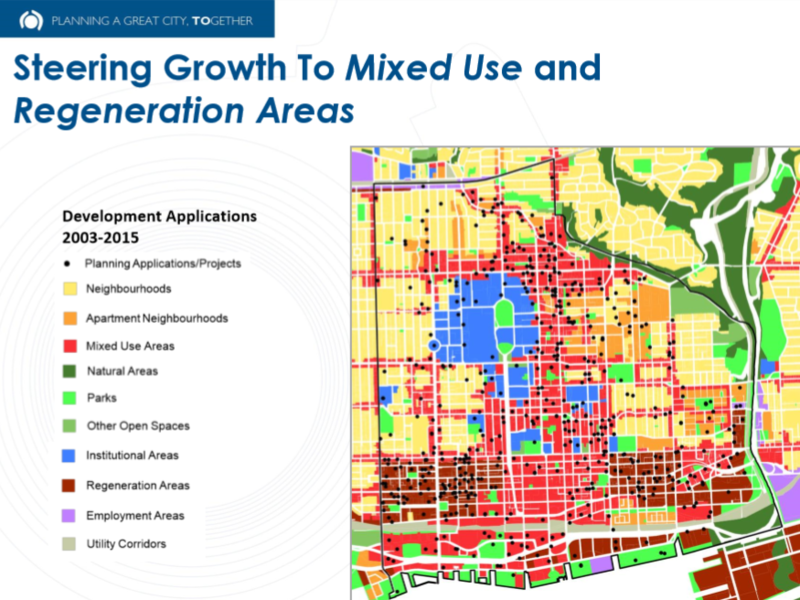 With Toronto’s downtown core experiencing persistent growth, it is important to address outstanding issues in preparing the city for future growth. 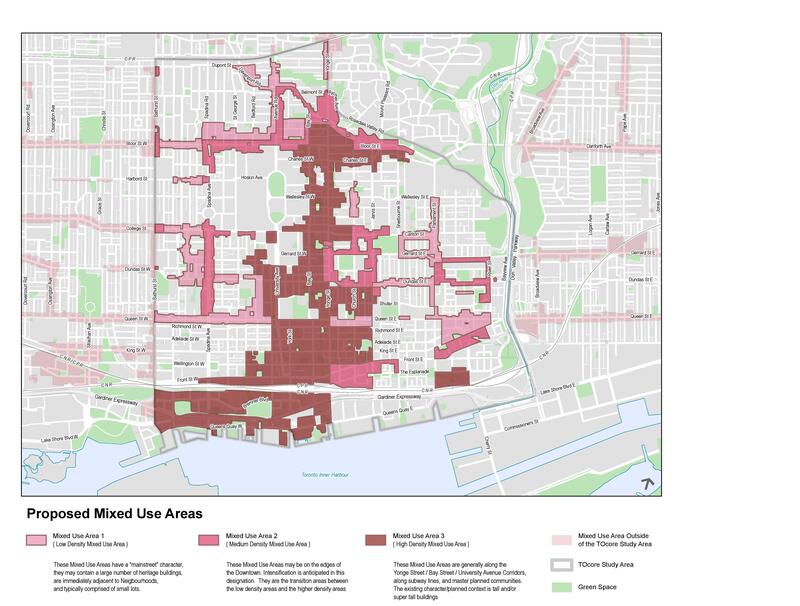 TOcore strategy is a City of Toronto plan created to address such issues by introducing seven areas of focus to improve the current function of the city. Meetings are held regularly by the City of Toronto, where stakeholders from local organizations and BIA’s provide feedback in improving the planning process. Opinions are raised over a wide array of topics, ranging from sustainable development, to mixed use development; with a common goal of creating a more welcoming and livable city in the future. 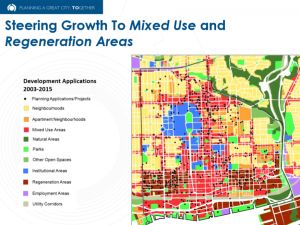 Current changes in Toronto’s downtown core, including adjustments in mobility, transit and infrastructure development will serve as a major influence on how the city will function in the future. One of TOcore’s primary strategies is creating an accessible and mobile downtown core, with a focus directed towards surface transit such as LRT’s (Light Rail Transit). Accommodations are also made for alternative modes of transportation through development of bike lanes, parking, and bike sharing programs. This program would provide relief to highly congested streets such as King Street, which will be undergoing redevelopment starting 2017. King Street is one of few streets in Toronto which is seen as having insufficient transportation, through limited methods of mobility and lacking transportation services containing major delays. Changes are being implemented in terms of improving services, with busses being available more frequently, alongside increased parking restrictions, where liming street parking to allow greater flow of traffic. These are some of the changes presently being worked on, with further studies taking place in analyzing the regulation of traffic and how these changes may influence the area. 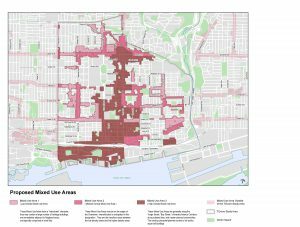 The plan also focuses on mixed use development, where areas with low and medium density are focused on becoming more walkable and accessible; with close access to local stores, services, and amenities. Further improvements in transportation would also lead towards greater accessibility towards the provision of services. High density areas such as the downtown financial district are directed on providing walkable distances to Union Station and the PATH network. Additionally, creating more business centers in other parts of the city would provide easier mobility and accessibility to jobs. This also prevents further clustering of particular land use types in specific parts of the city and provides relief towards congestion by spreading development through different uses. The goal of the TOcore strategy is to be fully implemented by 2041. Consultations will continue to take place into the future with updates on TOcore’s progress, as well as feedback from local residents and organizations. Plans and studies will progress, with different divisions of the City of Toronto working alongside organizations and residents, with a common goal of making Toronto a healthier, better transit oriented and more accessible city. Today CodeRedTO’s Executive Director, along with several members of our partner organization Move The GTHA, met for over an hour with Ontario Premier Kathleen Wynne and Minister of Transportation Steven Del Duca. The meeting was a frank, wide-ranging, and engaging discussion of transit goals, priorities, and advice, including our hopes to see both short- and medium-term “wins” to bring better transit to more GTHA residents sooner. Topics discussed included governance, current projects, future project decision-making, public education, and potential future revenue streams. We were pleased to have significant give-and-take, and to make clear our interest in continuing to push for better transit and less political interference. Members of the Move The GTHA collective and CodeRedTO look forward to continuing our discussions with the provincial government. Spearheaded by passionate local transit advocate/guru and prolific blogger Steve Munro, on June 19th Spacing Magazine, CodeRedTO, the ITE, and the Cities Centre welcomed Jarrett Walker, author of Human Transit: How Clearer Thinking Can Enrich Our Communities and Our Lives, for a lecture on improving our thinking on transportation. 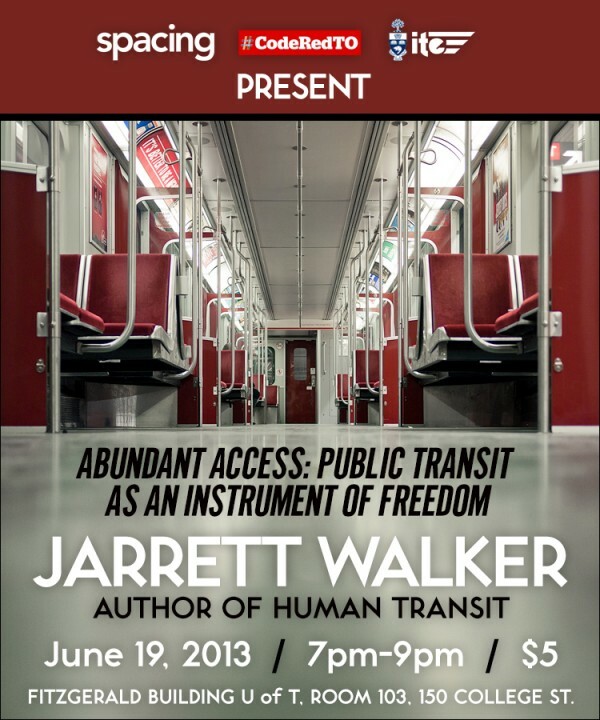 Titled “Abundant Access: Public Transit as an Instrument of Freedom”, Walker took the crowd of over 120 through important concepts in transportation, and discussed how some of the least visible attributes of a transit service can be the most important. He also discussed the challenge that transit planners face in creating useful transit. Too often, new lines are unintentionally restricted to less useful operation, reducing their likelihood of success. The most common examples are standalone loops, which visit every required location and therefore seem like a tidy solution. 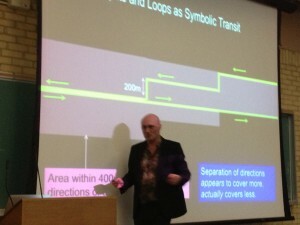 “But very few of us wish to travel in circles,” Walker reminds us. Another example is separating each direction of travel onto different streets. This seems to help traffic flow or bring a larger population into the catchment area, but in fact it reduces the usefulness of a service as now fewer people are within walking distance of both directions of travel – a requirement should they wish to actually use the service! For this reason, Walker said, he is far more excited about Toronto’s Eglinton Crosstown LRT than he is about the Finch West or Sheppard East lines. They are stub lines near the outside of the system, which he said translates into “transferring to keep going in the same direction,” whereas the Eglinton line cuts across almost the entire city and touches multiple subway lines and many major bus lines, vastly multiplying its impact. 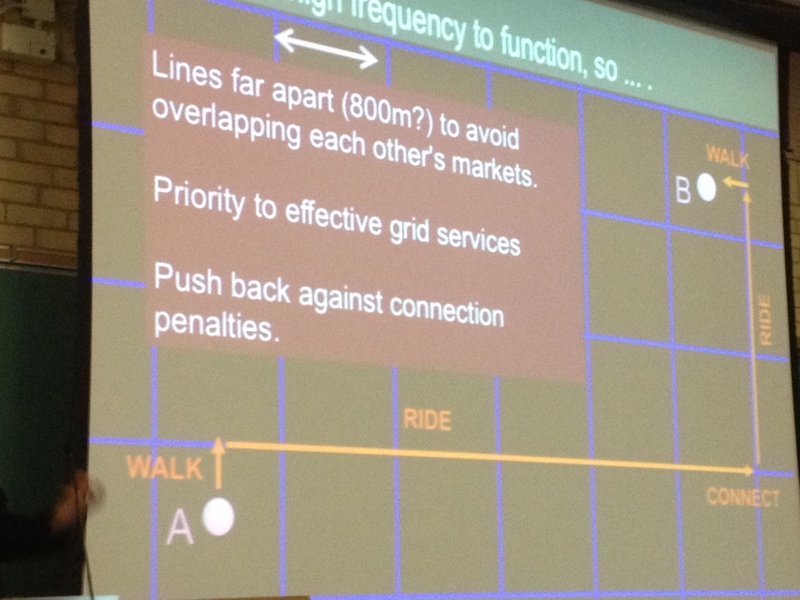 The grid approach to transit service allows much greater flexibility and ease of use, and “Toronto should be very proud of its grid,” said Walker. Walker also made a point that will resonate in some way with nearly everyone familiar with transit issues in the GTHA: it doesn’t matter whether it’s on rails or wheels (i.e. LRT or BRT), but rather it’s the service design (the “RT” part) that has the impact. Rails that can’t move due to mixed traffic blocking its way, or buses that can’t move due to mixed traffic blocking their way, are equally poor service offerings, and don’t create real choice through revolutionizing the transit available. A poor design is inefficient, and therefore is not providing the goal: Abundant Access. Register here! Only 17 tickets remain as of 9:30am Monday! The pre-sale has ended already, but there are 60 seats available at the door – arrive early to guarantee a seat! In April and May CodeRedTO held a series of public meetings in Etobicoke (Jane and Finch, and Richview Gardens), Scarborough (Malvern), Leaside (Thorncliffe Park) and East York (Danforth and Coxwell) to share detailed information with the public on transit expansion projects happening in and near their communities. Metrolinx also presented information about future transit funding and their research into how other regions around North America and the world have paid for major transit expansion. CodeRedTO extends an open invitation to any community organization or elected representative who would like more information on transit presented at their event to contact us at any time. We have presented for MPs, MPPs, city councillors, and the University of Toronto, and we only use information from official sources and checked by transit agency officials. To review our presentation, just click below to download the PDF version of our slides. 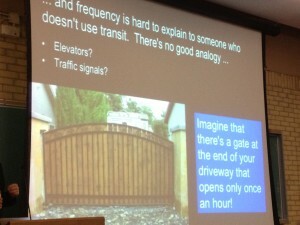 Some great questions were raised during our presentations, and we will share detailed answers soon. If you have any questions on transit expansion or funding, email info@coderedTO.com and we will get answers from the experts. Join CodeRedTO, Metrolinx, CivicAction, and TTCriders to talk about the future of public transit in the GTHA. Note we are listed as an expert but while CodeRedTO shares information found in research, please note that we do not have expert urban planning or transit engineering knowledge. Expanding public transit in our region is a pressing need. 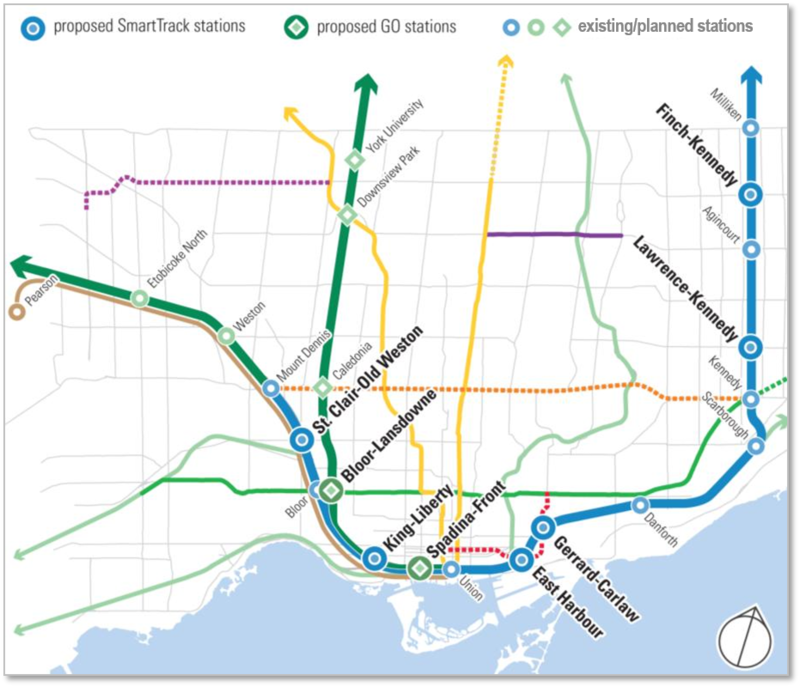 There is a plan (The Big Move) and there have been consultations from the province’s regional transit planning agency Metrolinx, the City of Toronto and civic groups. Now we want to hear from Ward 17 residents. To pay for the new buses, LRTs and subways, should government create new revenue tools? Pay for it with taxes? Raise fares? This is a chance for Ward 17 residents to hear from experts about the region’s pressing needs, the plans to build transit, and the options to pay for it. And like every Civic17 event, it’s a chance for residents to connect with each other and share their own views. Toronto transit advocacy group CodeRedTO will be hosting a series of public meetings about transit expansion and funding across Toronto during April and May. Our invited guests include all area councillors, MPPs, MPs, and representatives of Metrolinx. These Open House-style meetings will provide constituents with facts (both good and bad) on transit expansion projects, light rail and its impact, and about future funding for better transit in the GTHA. Half the time will be devoted to conversation and questions from residents, and some local councillors and Metrolinx have also offered to make presentations. 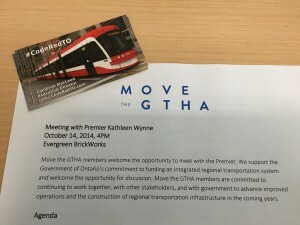 These public meetings are part of the ongoing Move the GTHA campaign, which promotes better information and funding, and more conversation on the future of transit, in the Greater Toronto and Hamilton Area. Who has been invited? All MPs and MPPs representing the areas close to future LRT lines, any Toronto City Councillors close to future LRT lines, along with BIAs and local community organizations. Public notices are also being shared online and with nearby libraries, schools, and community centres. About CodeRedTO: CodeRedTO is a volunteer-led transit advocacy group in the GTHA based on the principle of better decisions through better information. We provide facts about transit modes, options, and proposals, to assist GTHA residents in understanding and evaluating transit information and ideas. 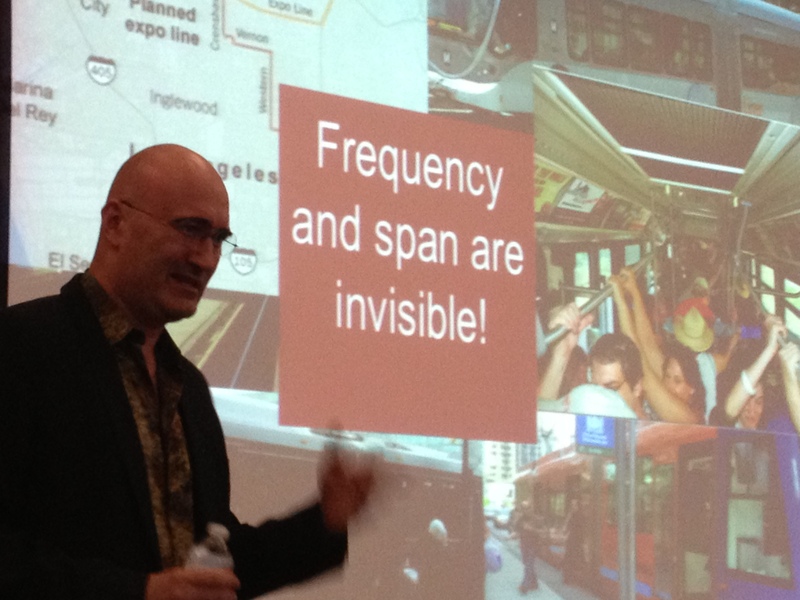 We are not controlled by any transit agency, elected representative, or business. We receive funding only from Metrolinx earmarked for community conversations in partnership with www.MoveTheGTHA.com, and all other activities are funded through personal donations.